Students will learn how to explore personal narratives through the development of imagery on clay. Each class will be introduce a new method of image transfer techniques which have been augmented from printmaking and photographic processes. Various techniques which will be covered include stencil making, water etching, decal transfer, and photo lithographic transfers. Students are encouraged to experiment and explore rather than produce a singular grand project. All levels are welcome prior experience with clay is helpful but not necessary. This class covers jewelry construction techniques including: piercing, drilling, soldering, riveting, forging reticulation and roller printing as well as hydraulic forming. Advanced topics may include granulation, jewelry rendering, and blanking. In this class there is a strong emphasis on problem solving which helps students develop a personal design vocabulary. Multi-level classes allow new students to see a variety of advanced techniques and applications. Individualized instruction allows students to progress at their own pace. Please note: For safety reasons, all students must wear appropriate attire. Each class we will focus on creating functional ware to use in the home. By the end of 9 weeks you will walk away with a tea pot, tea cups, little plates for pastries, and a cream and sugar set. Techniques which will be demonstrated are coil building, slab building, and pinching. This course introduces the students to the tools, techniques, and vocabulary of clay through lectures, demonstrations, and studio participation. Students will learn a variety of hand-building techniques, firing and glazing to achieve finished ceramic works. Intermediate Students will build on knowledge gained in Beginning Ceramics to achieve advanced projects. Ever wonder what to do with all of those leftover soda cans? In this class students will be making their own backyard mini metal foundries. The class will practice using the foundries by first making aluminum ingots for quick and easy melting. Students will then either carve and sculpt original foam objects and/or create molds of found objects to duplicate utilizing spray foam. Demonstrations for various sculpting techniques and step-by-step instructions for mold making will be provided. Students will learn how to prepare their foam objects to cast in the burnout sand casting method, how to safely pour molten metal, and how to polish their final projects to a shine. This class is designed for beginners, so everyone is welcome. Please note: For safety reasons while casting all students must wear leather shoes. This class will cover two possible methods of relief printmaking- multi-block linocuts and reductive linocuts. Throughout the course, students will print several editions as they practice the varying relief methods. After gaining a basic understanding of carving and printing methods, students will use the method of their choice to create an edition of 15 2- or 3-color prints. After gaining a basic understanding of carving methods and color separation, students will carve 2 or 3 stamps intended for layered use, to create 2- or 3-color stamped images. In this course, students are challenged to treat fabric and textile as paint. We will explore and experiment with different mixed media techniques, involving collage and sewing, that push the boundaries of traditional two dimensional abstract painting. Through independent material sourcing, students are able to hone in on their personal interests as we delve into contemporary painting practices. As art becomes increasingly academic, there is greater demand on artists to contextualize their work through an artist statement. Through a series of group discussions, class presentations, and writing exercises, this class is designed to help students verbalize and transcribe their portfolios and art practices into a concise and effective artist statement that they can use to apply for grants, fellowships, residencies or graduate programs. In this two-day beginner level workshop, students will explore Photoshop and the tools available to create and manipulate photographs in this versatile software.Students will go over the basic tool bar and discuss photo manipulation. Please note: This class requires students to provide their own laptop. 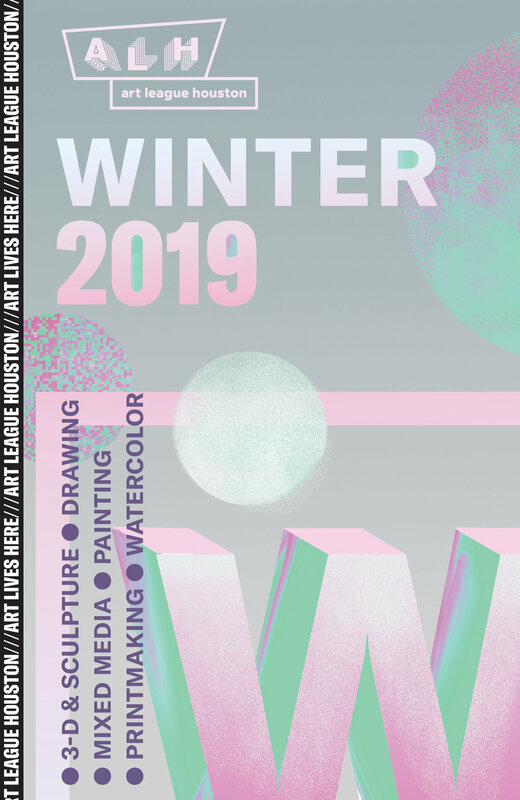 We will take a look at the history of collage from Braque and Matisse to our own Houston collage artist and designer Jerry Jeanmard and Austin-based artist Lance Letscher. Working through design and color we will produce abstract and representational pieces adding text or paint where needed. Explore the vibrancy and transparency of watercolor. The instructor will emphasize color, design, and contrast. Students will learn to layer and control the pigment and rescue the white paper while retaining the spontaneous, fresh-looking result. In this class, students begin painting in grisaille – painting executed entirely around monochrome and usually in shades of gray or brown – to eliminate the problems of color and value and to concentrate on accuracy of drawing and the effects of light. The second part of the class utilizes a limited palette, allowing students to explore and understand the harmony and unity of light. The model fee is due the first day of class and varies according to class size. Please note: enrollment for this course is limited to 6 students. This class is primarily concerned with painting the individual elements of landscape trees, water, etc. The instructor will demonstrate essential landscape painting techniques and students will be encouraged to make studies of these components necessary in a successful landscape painting. Please note: enrollment for this course is limited to 10 students. In this class, students will learn how to create abstract works by observing the real world of objects, landscapes, people and more. The course will cover different styles of abstraction as well as the basics of composition, color, and space. This class is suitable for all levels but requires minimal painting experience. This course introduces students to basic concepts and techniques of painting as a means of visual communication. The class will cover issues of color, texture, figure / ground relationships, visual and spatial concepts, paint handling and application in acrylic and oil, as well as introduce students to basic painting vocabulary by surveying historical and contemporary painting. In this modern method, we use oil over acrylic paint. The painting progresses first in layers of acrylic, followed by layers in oil. The simplicity of this method makes this class ideal for the beginner and a boost for the advanced student. Using this layering technique gives the student the leverage to create fine-tuned paintings. The finished paintings have a unique luminosity and a sense of depth. Please note: enrollment for this course is limited to 10 students. Narrative portraits document our shared experience as humans. They share stories that come from both personal experiences and the imagination of the painter. In this course, students will draw and paint from both live models and photographs they take of models. We will begin with drawings to warm up, followed by a session of photographing the model for use in a photo transfer process, which will be covered step-by-step. Students will also have the opportunity to experience a long-form portrait process, working with a model for a three-week period to create preparatory sketches, color studies, underpaintings, and finally a completed portrait. Each student will be assigned an artist to research and present during the semester to their classmates. This class is for both oil and acrylic painters with painting experience. Note: This class will meet once on Sunday, January 27, 2019. This course introduces fundamental skills in acrylic painting. Working through a series of exercises from a varied range of still life objects enables exploration of form, tone, color, texture and space. Gain experience in painting in a relaxed atmosphere where individual style and approach is encouraged. As each week progresses a new stage of painting will be discovered including: applying a colored ground, under-painting, modeling light and shade, glazing color, applying textures and composition. Reproducing Old Master paintings has been a common practice for artists for centuries. This workshop will show students step-by-step shortcuts in order to complete a fully rendered copy of a painting using a transfer method. This course will focus on completing one painting. During this process, students will learn approaches to composition, value, light perspective and application of color. This class is appropriate for beginning and intermediate painters in either oil or acrylic paints. Students will be asked to complete assignments between classes. If you have always wanted to paint but never knew how to start, this workshop is designed especially for you! This acrylic painting workshop is intended to prepare beginning students with the knowledge needed to begin creating their own acrylic paintings, or to move into a more intensive painting class with ease. You will learn the essentials of using acrylic painting materials, basic color theory and ways to begin a painting. By the end of the 2nd day, you'll have the confidence, skills and vocabulary to move forward into your next painting class, or solo artistic adventure! In this workshop the students will be demonstrated the basic techniques of color mixing, fusing waxes, and texture building using the encaustic process. After completing basic design elements, students will add various color pigment sticks and non-toxic Pearl-Ex powders to give the artworks an added depth through experimental approach. This workshop is sure to improve your confidence when it comes to utilizing this fascinating medium. In this workshop, students will explore a dynamic color theory process. By creating a monochromatic background, students will then mix in resin with the background's complementary colors, a color of choice or multiple colors. Through the act of pouring, drizzling, or directly painting on the surface of the panels, the results will be a series of soft, ethereal artworks. This class will allow students to more accurately draw what they see. Students will learn and implement a specific measuring technique that can be applied to drawing the figure, landscapes, buildings and objects. The first part of the class will be focused on learning technique and adding drawing skills. The class will then use the techniques in a more personal and creative series of self-directed drawing projects. In this class, students are introduced to French Atelier training to draw the human figure. The method of sight size, a fundamental scale system, is used to reproduce the figure accurately. Students work from a live model focusing on outline, proportion, shadow, shape, and value. The model fee is due the first day of class and varies according to class size. Please note: enrollment for this course is limited to 6 students. In this introductory drawing class, students will look at daily observational experiences and narrative approaches to drawing. Taking a journalistic approach, the student will log entries using various drawings techniques in graphite, charcoal, and watercolor techniques. The results will give participants a chance to digest and savor everyday observation through drawing. This observational drawing class will meet in buildings, parks, cafes and in various spaces around Houston. The first part of the class will be focused on refreshing technique and adding drawing skills. The class will then use the techniques in a more personal and creative series of self-directed drawing projects. Materials will include basic portable items for drawing, however students may incorporate other materials as they wish. Using basic materials, students will explore the fundamentals of drawing. Through various hands-on activities and class discussions, this course will touch upon observation, shapes, volume, value, line and texture. This class is intended for students with little or no previous drawing experience or those that want to sharpen their fundamental skills. Intermediate Drawing is for the student with some knowledge of shape, volume, value, line and texture. We will work from still life objects, portrait photographs and cover basic linear perspective. The materials we will use will range from graphite pencils, charcoal pencils and Prismacolor on paper. The intention of this class is to build a stronger foundation in drawing.